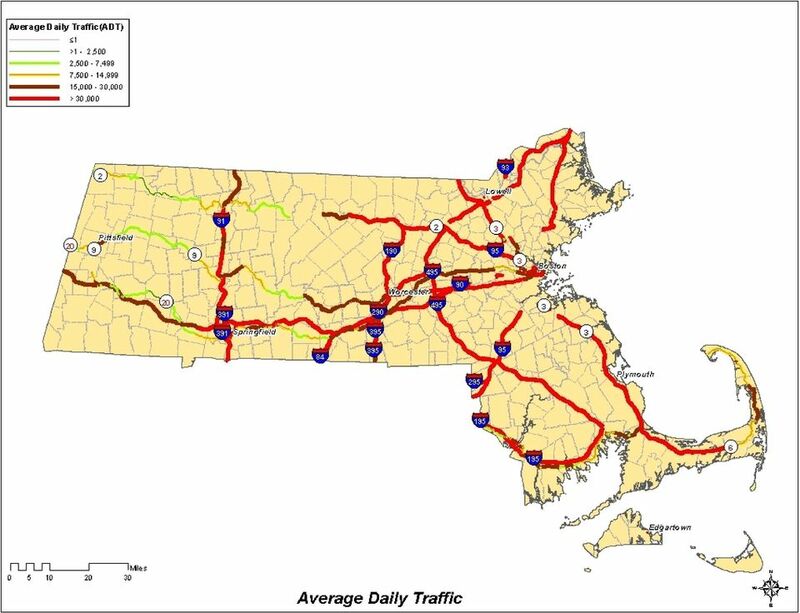 Download "STATEWIDE ITS ASSETS 1"
7 511 Travel Information provides real time information on all major roads in Massachusetts by simply dialing 511 on your phone and following the prompts or accessing information on the internet. 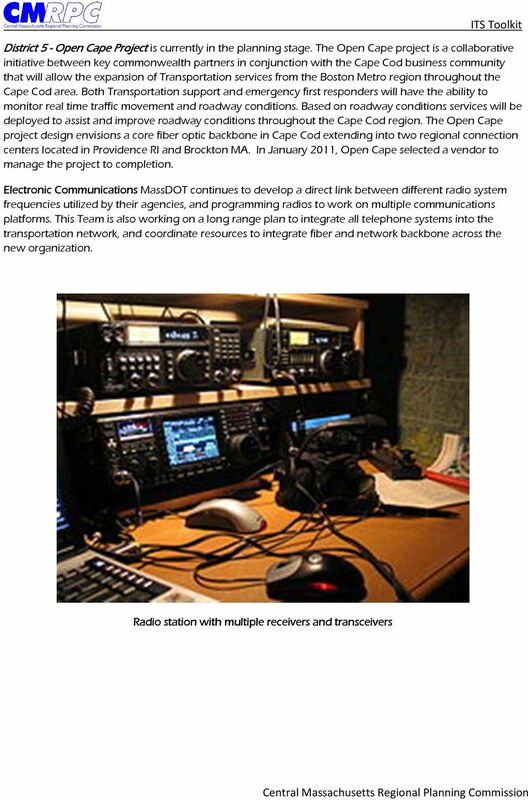 The MassDOT and their customer service team at Sendza are in constant communication to ensure that all customer comments and questions are being addressed. Messages are logged and useable feedback is considered and prioritized. The MassDOT/Sendza team continue to make changes and improvements to ensure patrons are receiving accurate and timely travel information. 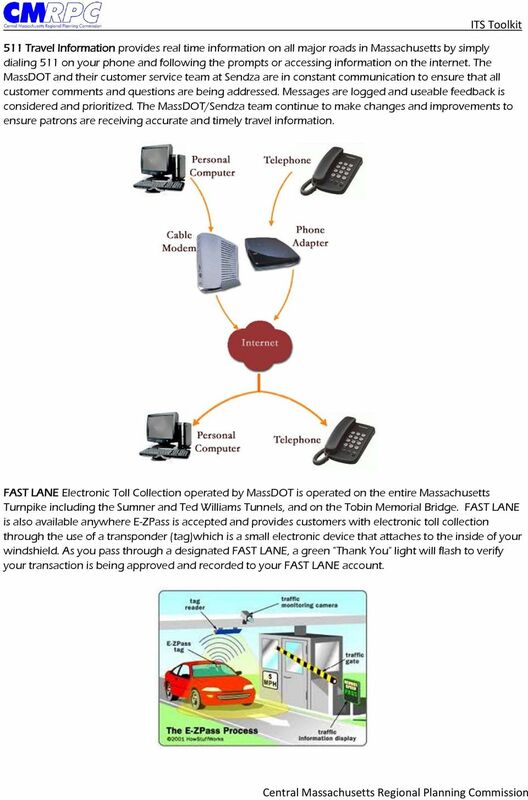 FAST LANE Electronic Toll Collection operated by MassDOT is operated on the entire Massachusetts Turnpike including the Sumner and Ted Williams Tunnels, and on the Tobin Memorial Bridge. FAST LANE is also available anywhere E-ZPass is accepted and provides customers with electronic toll collection through the use of a transponder (tag)which is a small electronic device that attaches to the inside of your windshield. As you pass through a designated FAST LANE, a green "Thank You" light will flash to verify your transaction is being approved and recorded to your FAST LANE account. 9 to operate the state s bridges, tunnels and surface roadway systems share video, data and information to communicate directly with emergency first responders regarding incidents occurring on all state owned facilities. 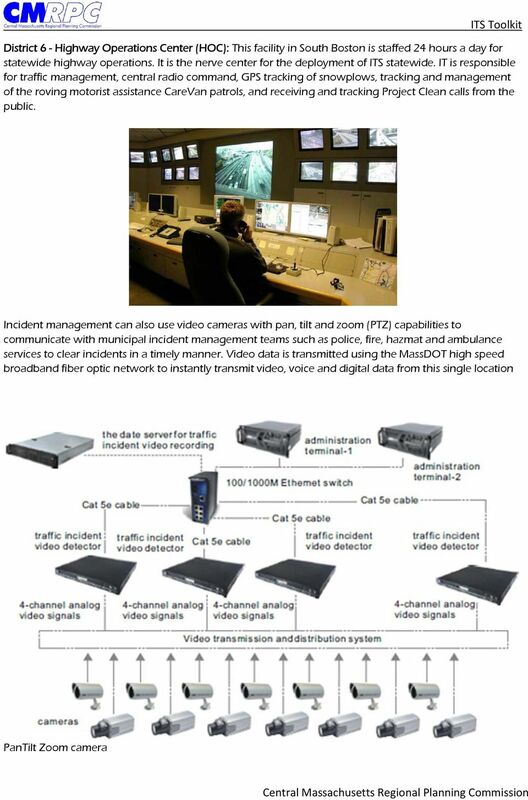 The HOC operates over six hundred (600) video cameras, located primarily along tunnels, interstate highways and state routes in metro Boston. The annual operating cost of the HOC is approximately $200,000. 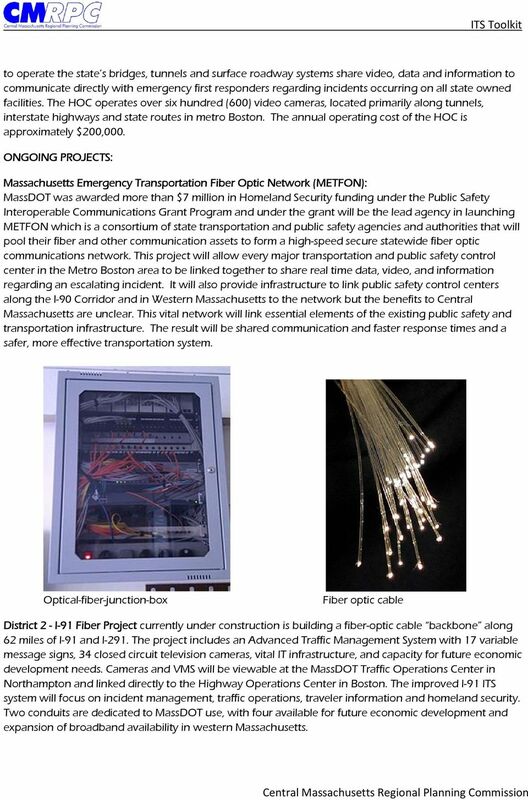 ONGOING PROJECTS: Massachusetts Emergency Transportation Fiber Optic Network (METFON): MassDOT was awarded more than $7 million in Homeland Security funding under the Public Safety Interoperable Communications Grant Program and under the grant will be the lead agency in launching METFON which is a consortium of state transportation and public safety agencies and authorities that will pool their fiber and other communication assets to form a high-speed secure statewide fiber optic communications network. This project will allow every major transportation and public safety control center in the Metro Boston area to be linked together to share real time data, video, and information regarding an escalating incident. 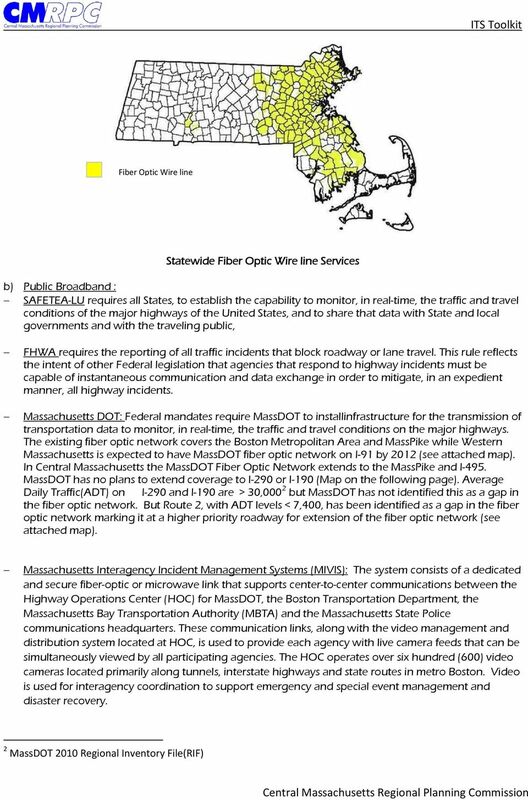 It will also provide infrastructure to link public safety control centers along the I-90 Corridor and in Western Massachusetts to the network but the benefits to Central Massachusetts are unclear. This vital network will link essential elements of the existing public safety and transportation infrastructure. The result will be shared communication and faster response times and a safer, more effective transportation system. 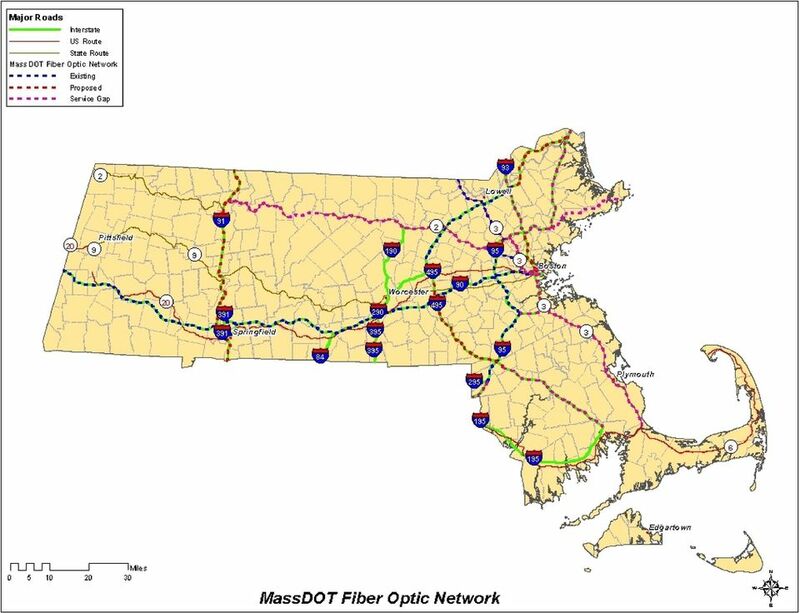 Optical-fiber-junction-box Fiber optic cable District 2 - I-91 Fiber Project currently under construction is building a fiber-optic cable backbone along 62 miles of I-91 and I-291. The project includes an Advanced Traffic Management System with 17 variable message signs, 34 closed circuit television cameras, vital IT infrastructure, and capacity for future economic development needs. Cameras and VMS will be viewable at the MassDOT Traffic Operations Center in Northampton and linked directly to the Highway Operations Center in Boston. The improved I-91 ITS system will focus on incident management, traffic operations, traveler information and homeland security. 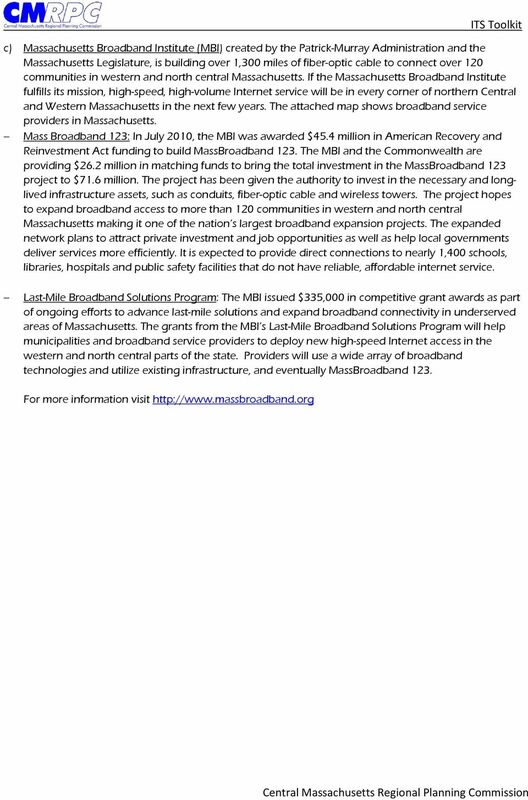 Two conduits are dedicated to MassDOT use, with four available for future economic development and expansion of broadband availability in western Massachusetts. Mapping Broadband Availability in New Hampshire Fay Rubin, NHBMPP Project Director NEURISA Lightning Talks Hanover, NH April 16, 2013 This presentation is funded under grant # 33-50-M09048 from the U.S.
City of Round Rock, Texas An ENCOM Wireless Client Success Story The Challenge Growing city, growing needs Round Rock, Texas was recently rated as the seventh-best small American city in which to live. QSL is a growing business that s offering IT Solutions and services to SME and Established Organizations with a high level of understanding and fully qualified, friendly and knowledgeable consultants. Oregon State Broadband Initiative Broadband Mapping Project January 2013 What is the Broadband Mapping Project? 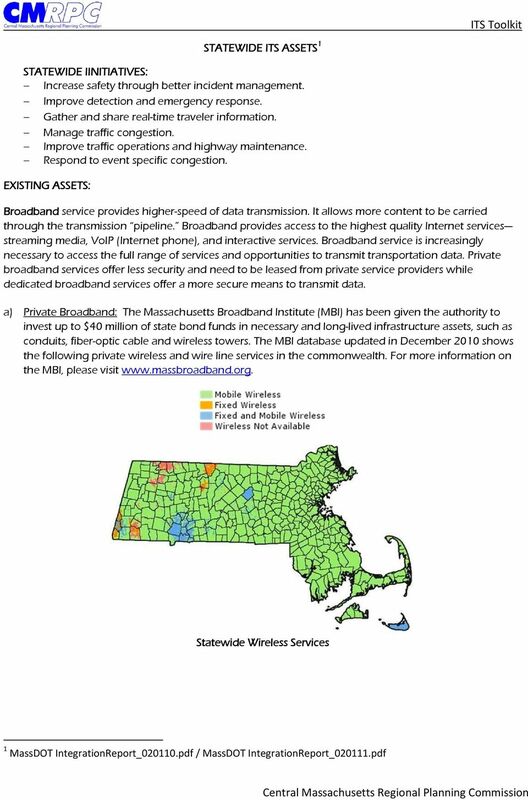 To create and maintain a statewide map based inventory of broadband internet availability.